This Pelican Memory Card Case is a tough, water-resistant case made to carry and store 12 SD cards, 6 mini SD memory cards and 6 micro SD cards. The memory card case has a removable insert liner that absorbs shock and protects memory cards. An extra plain liner is also included for custom configuration. 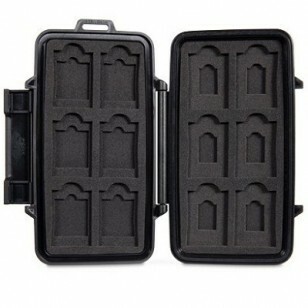 The Pelican memory card case has a snap closure that provides a secure seal for the contents.